People I know have been getting into RimWorld of late, which got me back to playing it as well. It exited early access back in October and had actually changed a bit since I last played. The changes were mostly in the details rather than any grand direction, but I did spot a few. Having to stay indoors due to some toxic fallout was a new one on me, for example. Fortunately the few times I have been hit by that it has been a short duration event, though the description indicates that it could go on for a long time. I usually play the default scenario without mods and my early game often follows a similar pattern. I try to be careful in selecting the characters I start with, making sure I have some coverage on all skills. Inevitably I realize later that the person I need to do something, like research, will end up also being the only person who can plant crops and they spend most of their time on planting. And then there is the usual scramble for shelter, beds, storage, then cold storage to keep food fresh, then actual food, which involves some planting. Then I try to get by on the few survival meals and the local berries and animals until the initial rice crop comes in. And then the potatoes eventually are ready for harvest and I find that I have so many that my food storage is full. But if I have gotten there at least I get through the first winter and can go on expanding from there. If a blight hits the potatoes though, it can be tough. My colony at that point had grown to 14 people. Most of them were getting along. Six of them had paired off into couples. Morale was high. Meals were lavish. The place was clean. About the only complaint involved tattered clothing, which is always a pain because each character clings to their favorite piece of worn clothing like an eight year old. I make them drop their worst item, they go pick out a replacement from the warehouse of clothing I had setup, the complaint goes away. Then I allow the old piece of clothing to be picked up, because it is laying on the floor where it was taken off and the character immediately runs back, takes off the nice new pants or whatever, puts on the old ratty pair, and then starts complaining about having tattered clothing again. Anyway, things were looking good. I could see the research wrapping up, me building some final items, and then getting the hell off the planet for the win. However, the AI seemed to sense my hubris and decided to teach me a lesson. It started off with a big raid. There were eight in the raid, but it didn’t seem too bad. They were forming to the south and were not attacking yet. I looked at a few of them and they had pistols. They weren’t going to be the push overs that another local tribe was, they were coming at me with spears and bows and I had been mowing them down and sending them flying pretty handily, but it should be manageable. I grouped my fire team into a sandbag pit at the south of the camp and prepared to lay into them as they approached. As they attacked things seemed to be going okay until one of the attackers got close and threw a grenade into my defenses, and then another. That blew out the sandbags, tore a hole though a granite wall, destroyed a turret, and wounded everybody on my team, incapacitating five of them. 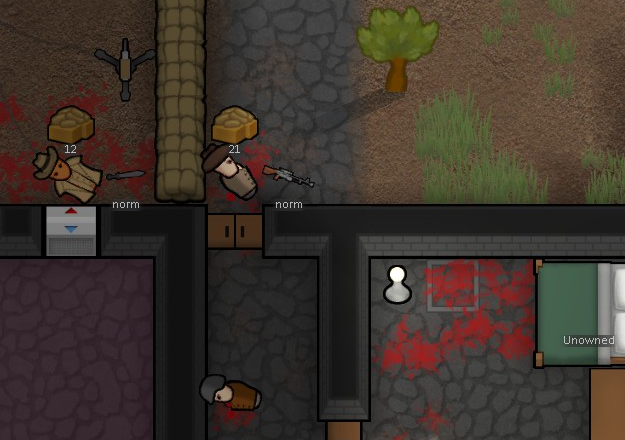 A couple of the wounded were still firing and the dogs were out and attacking, so they managed to defeat the raid, but now my colony was in a bad way. In the rush to get things back together four of the dogs died, the other two were wounded while four of the incapacitated colonists died within the next hour, with a fifth dying off the next day when another raid hit and he was killed by the spears and bows group as I was low on defenders and had to haul him out of his hospital bed to help fight. So my colony was a mess. Defenses on the south were gone, there was a big hole in the main building, there was blood and mess everywhere, and no one had gotten around to burying the bodies. Morale was taking a serious hit. All three of my couples lost one person. Everybody was despondent. RimWorld is as much about crisis management as it is about base building. I likened this situation to being a manager at a high tech firm after a big layoff, something I’ve been though. You have less staff, the same amount of work to do (if not more), and morale is at rock bottom. The only good news was that one of my non-violent colonists had managed to recruit the prisoner we had been working on, so I had a fresh person who could handle a weapon. There was that and the smokeweed crop had matured, so I expected there would be some binges on that front. When colonist morale gets to low they can suffer a mental break, at which point they go off and do whatever it is they takes them on their own. Some wander or hide in their rooms. My main researcher, who lost her husband, went off on a smokeweed binge. But sometimes the reactions are destructive. I had one colonist throw a tantrum and start breaking things. That didn’t last too long and was pretty well contained. But then another colonist broke and went on a fire starting binge. He ended up in the cold storage for food, setting fire to the potato crop stocked in there. Apparently frozen potatoes burn very well in enclosed spaces. The fire in there got out of control, with the temperature rising above 1,000 degrees Fahrenheit, incapacitating the people who ran in, one by one, to try and put it out. So I had to haul people out of the fire and just let it burn out. Since it was by the kitchen and the dining area, all of my prepared meals went up in the conflagration. Fortunately I hadn’t used wooden walls. Stone kept the fire contained. But now, with the only remaining cook incapacitated in a hospital bed, the colonists were reduced to eating raw potatoes, which added to the morale problems. That set off one colonist who went berserk and started attacking people. He happened to be a melee combatant too, so had a steel gladius equipped. He killed everybody in the hospital room and the remaining dogs before he himself was shot dead. Then there was another raid. At least it was the bows and spears team again. But after that I was down to three colonists, all wounded, the colony was a disaster, there were unburied bodies all over, and all I could think was that my statement about approaching the end game now seemed premature. And, of course, the three remaining colonist were all complaining about their tattered apparel. But that is the way it rolls some times with RimWorld. And it is always fun to see if you can bring things back from the brink. This entry was posted in entertainment, Other PC Games, Steam and tagged RimWorld on January 30, 2019 by Wilhelm Arcturus. RimWorld is good for some drama if nothing else. As to the tattered clothes, you can edit the “Anything” wear restriction so that your colonists will only wear items that have 51% and higher durability. That will at least stop them from the mood penalty from that. Can’t do much about anything else unfortunately.